Priskilly Forest Country House01348 840 276work01348 840 276fax Guest AccommodationA personal warm welcome "Croeso" awaits you in this Historic Georgian Country house that date's back to 1326 and mentioned in the Black Book of St David's. Priskilly Forest Country House is in a beautiful setting and has a chateau appearance, approached through a rhododendron drive. Splendid walks in timeless relaxation and peace with only the birds songs. Spacious rooms and tasty food. Unwind in large comfy beds and enjoy delicious breakfasts. A sweeping staircase leads you to spacious en-suite rooms and mouth watering Welsh breakfasts are served in newly refurbished dining room. Relax on cozy settees near a huge log fire and enjoy original features in timeless relaxation in William Morris inspired Drawing room sipping coffee or sip a glass of wine kept in the the arched cellar which you can view on request. Celebrating over 3 decades of golf, Priskilly Forest has it's own 9 hole mature golf course. so what better time is there to plan your short break or weekend getaway or enjoy a small celebration in our own bespoke way. 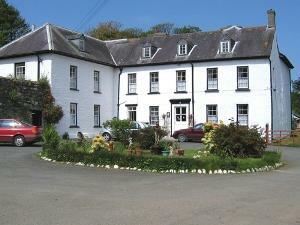 Centrally situated to explore St David's, Porthgain, Fishguard Port and Newport. A Warm Welsh Welcome awaits - Croeso Cynnes Cymraeg. Oddiwrth Teulu Evans, Sir Benfro i'r hen Plas Priskilly. Why not organise a family reunion or gather a group of friends together for either a relaxing break or energetic walking or golfing break followed by a chill out at the country house which is ideal for all occasions.We can help and advise all the arrangements to make a memorable occasion very special. Why not pre-order a posh picnic for an evening of relaxation.